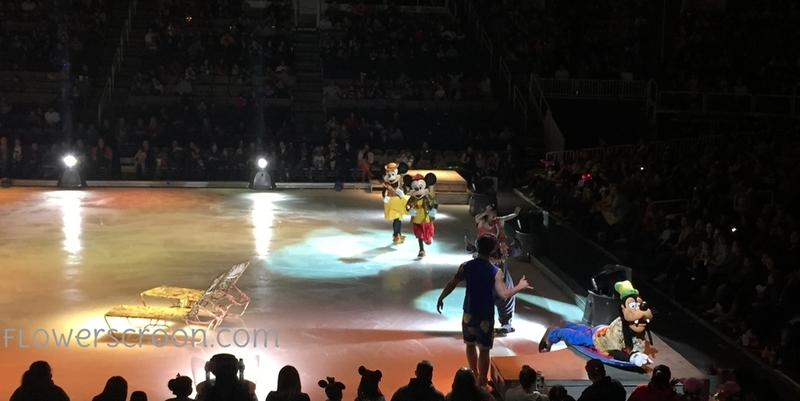 Disney promised a "colossal party on ice" and they delivered last night at the SAP Center during Disney on Ice presents Let's Celebrate!. 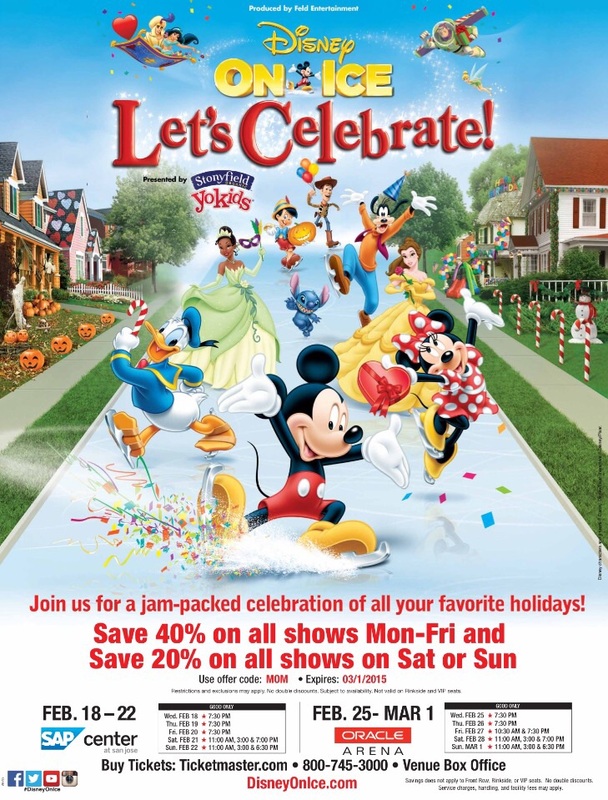 With performances through Sunday, February 22, the show stuns with over 50 Disney characters, beautiful sets, talented skaters and classic Disney magic. There's no point in throwing a party if you can't invite all your friends. That's why the show opens with Lumiere inviting everyone to "Be Our Guest". Featuring the coolest kickline ever, the show began with a bang! Mickey and Minnie make their grand entrance and announce they are looking for a "celebration of celebrations". They came to party! As soon as the Mad Hatter hears that, he decides to throw "A Very Merry Unbirthday" party. 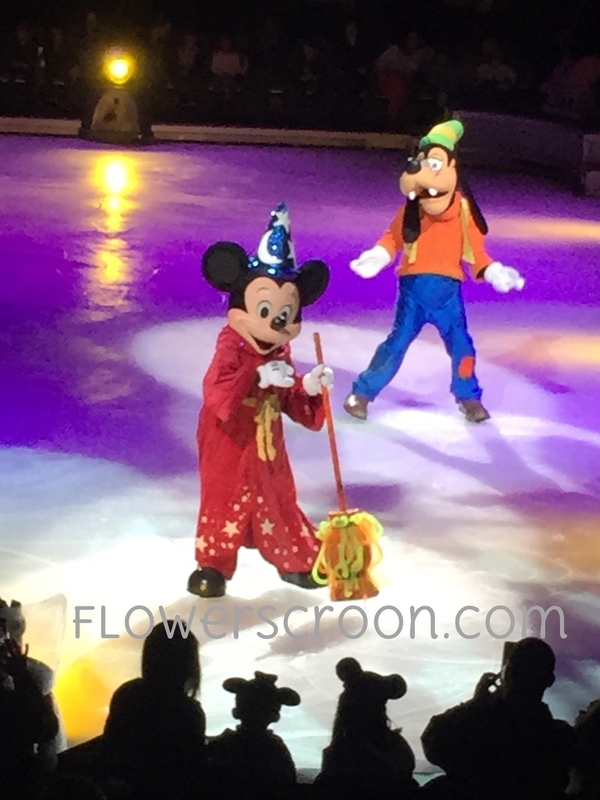 The party ends in chaos, and soon Mickey finds himself cleaning up after everyone - with a magical broom of course! “The Sorcerer’s Apprentice” segment is visually stunning, featuring brooms in spectacular costumes that glowed under black lights. Once Mickey has the enchanted brooms under control again, Minnie tells him one of her favorite celebrations is Halloween. Instantly Jack Skellington from "The Nightmare Before Christmas" arrives and throws his own spooky party. His solo performance is my favorite of the show. Joining Jack are popular Disney Villains Cruella De Vil, Captain Hook, Jafar, Maleficent and that scary hag witch from Snow White. Mickey thinks it's just a regular trick-or-treat party, but when things get a little scary, Minnie and friends rescue Mickey. Although spooky, I wouldn't quite consider this part of the show too scary for little ones. To lighten the mood from spooky to sparkly, the Fairy Godmother suddenly appears to help Minnie in her quest to find her own fairytale prince. After a few chants of "Bippity Boppity Boo" from the very enthusiastic audience, Minnie emerges in a beautiful new gown fit for a princess. 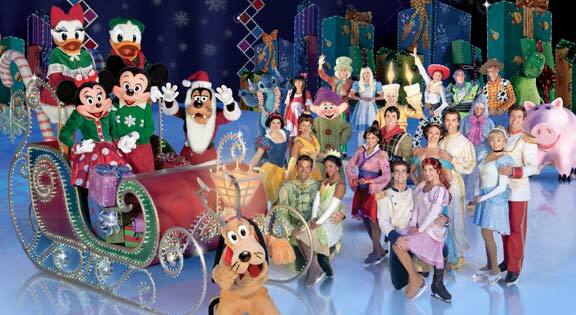 Minnie is suddenly at a ball along with all of her favorite princesses and their princes. Starring Jasmine and Aladdin, Belle and Beast, Cinderella and Prince Charming, Ariel and Eric, Mulan and Shang, Tiana and Naveen, and Snow White and her prince this segment featured beautiful couples' skating that left the audience gasping. I thought this was really well done. Minnie discovers her prince is of course Mickey, and the entire ball dances to "That's How You Know" from the movie "Enchanted" which is the most epic thing ever especially when your 17 year old daughter knows all the lyrics and starts singing really loudly. The show then breaks with an intermission that gave us all enough time to take selfies, use the restrooms and buy popcorn and another flashing slushee cup. Act 2 begins with Mickey and Minnie en route to their summer vacation. Mickey has a newfangled gadget that he thinks will help them plan an even better trip. They begin together in Hawaii with Lilo, Stitch and dance along to “Hawaiian Roller Coaster Ride”, but soon the gadget malfunctions ands ends up separating them and sending them off on different adventures. Mickey visits Brazil for Carnivale, where he celebrates with beautifully costumed dancers. Then he is transported to China where he dances with a dragon. That was so much fun to watch considering the Chinese New Year is upon us. In her travels, Minnie visits Japan, and dances at the Sakura festival. She looks so very pretty in her kimono! Thankfully Princess Tiana and her beau Naveen are able to reunite our favorite mouse couple in New Orleans - just in time for Mardi Gras. They dance to "Dig a Little Deeper". As luck would have it, Minnie's other favorite holiday is also my other favorite holiday: Christmas! Santa Goofy drops in through the chimney, and the cast of "Toy Story" arrive to help Mickey and Minnie celebrate Christmas. The As the finale approaches, Christmas decorations fill the ice and Mickey and Mickey board a beautiful, giant sleigh. 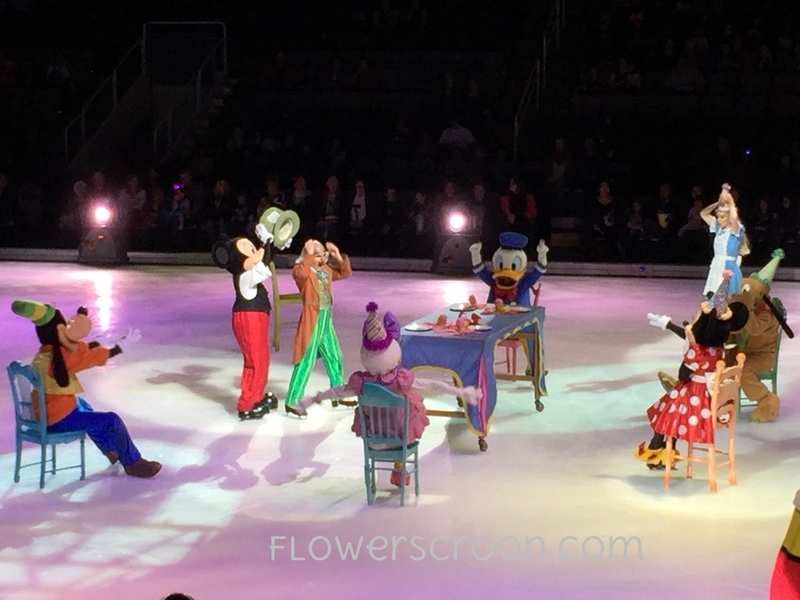 Tinker Bell joins the other characters on the ice and with a little pixie dust, gives a grand finale featuring snow and indoor fireworks. The ooohs and ahhs from the crowd arrived on cue! Fireworks and snow - just like at Disneyland. The perfect ending to a show that celebrates celebrations. At two hours the show is the perfect length for little ones, and the theme - while a little loose - is one of joy. Take the kids and your adult Disney fan friends - there is no age limit! Our entire family enjoyed the show - from elementary school age through high school. You'll love it too!